We use our phones for just about everything. They play the part of taking and receiving calls of course, but we also have texting, games, answering emails, surfing the web, and listening to music. It has our whole lives hiding inside, and helps us to be more productive (if we choose to be). The only problem that many of us face, is that our screens and some of the controls on our phone are too small. That’s why many people have moved to phablets. If all you’re really concerned about is playing games and music, then having a little controller that won’t be too cumbersome to carry around might be nice. 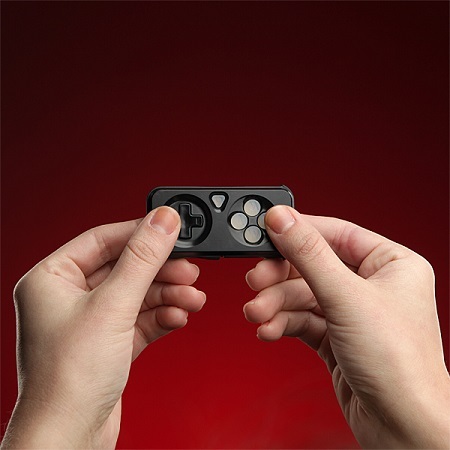 The iMpulse is supposedly the world’s smallest gaming and media controller, and will fit snugly on your keyring. It has a D-pad and 4 buttons on the front, and two buttons on the back. This has a 100 foot range, making it perfect for turning up the volume from afar. There is an SDK available so you can turn this into your controller for whatever you’d like. It has rechargeable batteries, and can be juiced up via microUSB. The buttons feature white backlighting, and it can chirp if you’ve lost it, but are still within range. That would be quite exquisite for making sure you don’t lose your keys every morning. It uses Bluetooth version 2.1, and can be used on either your Android or iOS devices. This will cost you in the area of $40, but seems like it would be worth it in the long run.